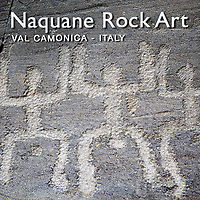 Pictures of prehistoric petroglyph rock art of Pictures of Naquane National Park, Valle Camonica, Lombardy, Italy. Part of the Museo Nazionale della Preistoria della Valle Camonica ( MUPRE - The National Prehistory Museum of Valle Camonica ), the Naquane National Park is an outdoor archaeological park with prehistoric rock carvings dating back to the late Bronze Age and early Iron age. The petroglyph rock carvings have been credited to the Camunni who lived in the Valle Camonica. They were prolific rock carvers and the Valle Camonica is has the biggest density of prehistoric rock carvings in the world. The rock carvings can be found in burial and religious sites as well as deep in the wood of Valle Camonica and high up on the valley sides. Some sites seem to have religious importance such as The Massi di Cemmo archaeological site, and the carvings at the Naquane National Park may also have been at the centre of meeting areas where rites would have been performed. The subject matter of the rock carvings covers hunting scenes, warriors fighting, what appears to be ritual processions and collectively this prehistoric rock art gives an insight into the lives of the prehistoric peoples of Lombardy. The Naquane National Park is part of the UNESCO World Heritage Site that covers this part of the Valle Camonica.